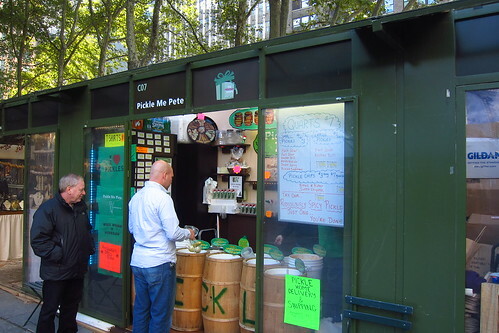 The Shops at Bryant Park opened up last week, and there seems to be more food options that ever before. In addition to the regular booths, a few lucky vendors like Aroma Espresso Bar have double booths with more than enough room to hang out for a few minutes inside. I stopped by the other day to get a look around, and a taste of the “Mmm…Enfes” that Brownie raved about. I found the Turkish booth in the NW (42nd+6th) area of the park, next to returning Vegetarian Oasis and Wafels & Dinges. I went with the chicken and dill gozleme, which is now selling for $6.50, and found this Turkish burrito adequate as your main lunch. I was thankful that they are heavy-handed on the dill and asked-for hot sauce because chicken and cheese on its own would be incredibly bland. The homemade phyllo wrap was excellent–thin enough to not add too much starchy heft, but thick enough to hold everything together. As I walked around, a few new vendors caught my eye. One was Brooklyn’s own “Pickle Me Pete” right by the fountain. I’m like Snooki when it comes to pickles, so you can expect me to be stopping by for some kosher dills before the seasons up. I did pick up a small one for $1, and it was briny, garlicky, dill goodness. Another vendor on my list is “Daisy’s Grits” by the Southwest Porch. Though it seems pricey for grits, I am intrigued by someone selling Colombian Chorizo or Cantonese Crab grits. The Southern in me says blasphemy, the Northern in me says interesting. Any early adopters on these grits, please let me know your thoughts in the comments. There seem to be just as many dessert options as there are savory ones. A fair number of booths are selling chocolate or hot chocolate (enough that there may need to be a head-to-head), but I made my way back to the other side, towards the library for some churros. Sophie’s–no relation to Sophie’s Cuban–is selling freshly made churros and Bavarian hot cider. According to them, Bavarian cider is cranberry juice and orange juice, mulled with spices. It’s tarter than regular cider, and might be more enjoyable for those needing a hot drink, but not something too sweet. 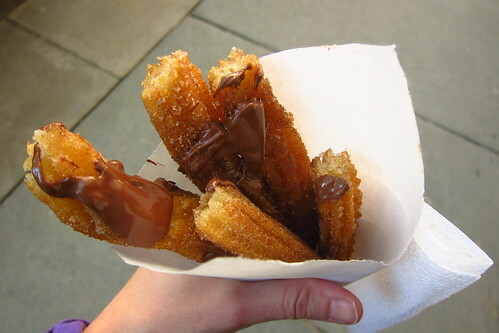 The churros, though fresh and delicious, were especially pricey at $5. My addition of some Nutella evidently cost an extra $1 too! Since you do get about five, it’s a good dessert to split with a friend because after eating lunch, it totally puts you over the edge into a food coma when eating alone. 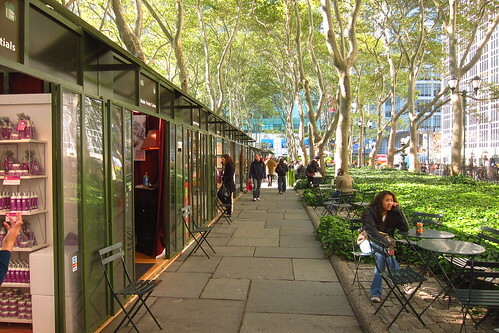 The Shops at Bryant Park are going on every day until January 8th. Posted by Blondie at 9:45 am, November 3rd, 2011 under Bryant Park. 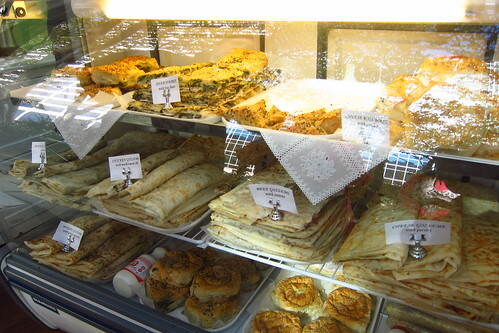 I’m excited to try the Turkish place. 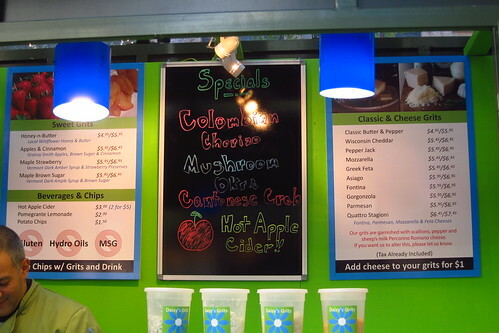 I stopped by the Shops two days ago and found some outrageous prices: $5 for one plain mozzarepa at the mozzarepa kiosk and $5 for one chocolate chip cookie at Max Brenner. I hope the rest of the places are a bit more reasonable. Had the grits today, sure a bit pricey but coming off being sick and having no appetite for the for the finer foods in midtown, it was absolutely what I expected and perfect. Everything there seems pretty expensive but I’ll gladly get some pickles. Tried the Mozarepa stand last night, even though street fair-type arepas are usually too sweet for me (prefer Caracas Arepa Bar). This one was tasty, with the pepper jack filling and guacamole and salsa on top. (The salsa isn’t on the menu, but they offer it when you order.) I think it was $6, comparable to Caracas takeout prices.